Could it be that the economy is on its way back to health at the same time winter releases us from its clutches? Actually, we’re not sure, but we were encouraged when we heard about a large new restaurant opening in Marblehead and stopped in to check it out. 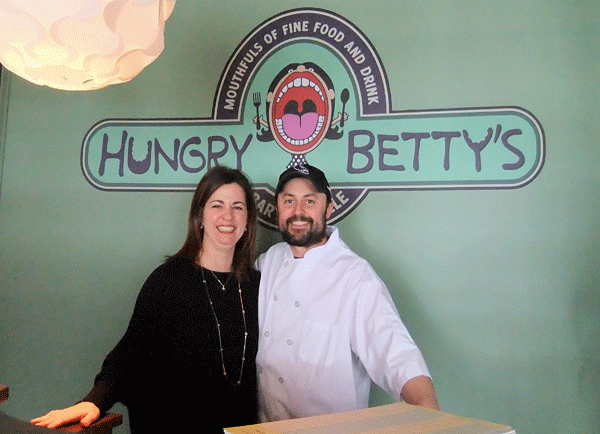 Hungry Betty’s is a casual dining restaurant located on the second level of the Village Plaza on Pleasant Street. Owner Patty Johnson, who took a few minutes out of her busy opening weekend to talk with us, has worked in restaurants for more than 20 years. The past 10 of those years she’s provided food and beverage to the members of Marblehead’s Dolphin Yacht Club. The menu she developed for the new restaurant with Chef Billy Glidden is highly accessible, with casual comfort food at reasonable prices. One of Johnson’s main goals is to provide a place for families to come on a regular basis—whenever parents don’t feel like cooking. In addition to entrees like burgers, haddock, meatloaf, stir fries, and chicken with fig/onion sauce ($9 to $17), there is a $5.25 kids menu that includes grilled chicken, pizza, chicken fingers, and a cheese quesadilla. All of the food is made from scratch on site. There’s an 18-table dining room, a bar that seats 16, and a lounge area with another 15 tables. The décor is fresh and soothing, with neutral tones, black furniture, and plenty of light. Johnson noted that she wanted to stay away from the typical nautical theme. 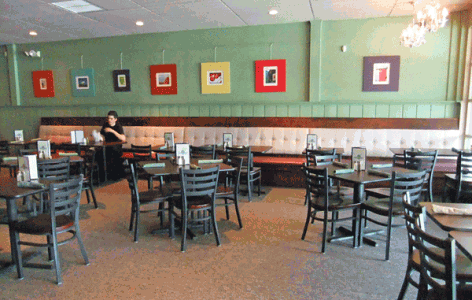 Although many of the restaurant’s crew are people Johnson knows from the Dolphin and other previous jobs, she held back a bit on the opening menu. There are plenty of choices, but Johnson said she has more offerings planned once the kitchen and front-of-house staff gets its sea legs, so to speak. For example, the salmon salad entree comes in a large chilled bowl and is a popular choice; Johnson plans to add several variations. Johnson, who has lived in Marblehead since 1989 and whose nickname was the inspiration for the restaurant name, believes the time is right for this type of establishment and for the Village Plaza to be revived as a destination for Marbleheaders. We applaud her seemingly boundless energy and once she and her crew have settle in, we’ll return to try the food—we’ve got our eye on the steak bomb egg rolls.